On 5th of November companies Graitec and Autodesk organized an event for leading architectural and engineering companies focused on BIM. The event took place on the premises of the ancient Brevnov monastery in Prague. Mr. Patrik Minks, Autodesk Territory Sales Executive, opened the event with short summary of the terminology and benefits of BIM in the construction industry. Mr. Miroslav Vyčítal, main site manager at SKANSKA, introduced the audience to the construction company’s experience in the implementation of BIM processes in their projects in Czech Republic. On projects of customers using Advance Steel and Advance Concrete, Mr. Tomáš Huml, Graitec Local Product Manager, demonstrated the exchange data between individual professions, with focus on steel and concrete constructions. The participants appreciated the international know-how in the field of BIM delivered by Graitec. GRAITEC is preparing similar events in other European countries. Bridge engineering is moving towards BrIM (Bridge Information Modelling) and looking to capitalise on the potential time and monetary savings already being realised through use of BIM in Construction. This brief overview shows how models can be transferred between disciplines (Design and Analysis in Advance Design through to Situational representation in Autodesk Revit to a Detailed version in Advance Steel) – using a single model from Analysis to Build. Launched at the end of February 2013, BIM GRAITEC ADVANCE is the global CAD / Analysis & Design solutions for the construction engineering field. Advance CAD is part of the GRAITEC structural BIM solution and a newcomer in the GRAITEC Advance suite. GRAITEC’s Advance CAD is fully compatible DWG® CAD software. It provides its users a simple, natural and economical solution to the frequent requirements of drawing creation and modification. Advance CAD creates all 2D entities (lines, poly-lines, arcs, circles, polygons, etc.) and associates all desired colors, line styles and shading. Concepts such as “layers”, “snap points”, “windows” are available as well as all navigation features (zoom, pan, orbit, etc.). Advance CAD can also create and handle 3D solids (cubes, spheres, cylinders, etc.) and perform Boolean operations. In the complete 2D/3D CAD environment of the software, you can find all the common CAD tools and features, several innovative features meant to enhance user productivity, but also 3D modeling tools for drawing 3D solids, functions that allow face editing for 3D elements, all these wrapped up in a user-friendly, simple and intuitive interface. The user interface is designed to get you familiarized fast with all the software elements and functionalities: quick access toolbar manager, ribbon tabs, customizable menus, keyboard shortcuts, auto-completion of commands, selection filters. It also offers you the possibility to customize general settings such as display, paths/files, user preferences, crosshairs or profiles. Advance CAD provides full compatibility with AutoCAD®, using most of the same file formats including those for drawings (.DWG files), commands, line types, hatch patterns, and text styles. Advance CAD reads and writes .DWG files in their native format without data loss, from AutoCAD® 2012 and going all the way back to Version 2.5, including AutoCAD LT®. Because Advance CAD uses Autodesk® DWG™ format as its native file format, no conversion is required. Advance CAD offers users all the professional 2D and 3D modeling tools and functionalities and at the same time it is cost effective. You can download the DWG sample files from here. GRAITEC, an international developer of 3D BIM Design-Build and Structural Design software for the construction industry, reports a turnover of 30.8 million Euros for the fiscal year ended December 31st, 2012. GRAITEC revenue organically increased by +20.3% compared to 2011. The Advance BIM suite had a +30% increase in turnover and Advance Steel had a +54% in turnover compared to 2011. Turnover of 30.8 M€, an increase of 20.3% compared to 2011. The consolidated EBITDA increased +125% compared to 2011 reaching 5.4 M€. GRAITEC Advance is the complete BIM software solution, from design to detailing, intended for the international market. Western Europe, in a difficult context for construction, GRAITEC grew in 2012 by 24% in Western Europe. GRAITEC Germany led the Western European growth at Graitec with 21% increase in turnover. Each and every solution sold by GRAITEC Germany performed in 2012, from Advance Steel that registered a +26% growth, to the special performance of Advance Bridge 175% growth, and adopted by the key regulation organization in the industry. The Structural Analysis business, after a difficult 2011, is back on track and showed in 2012 a strong dynamism with 84% increase in turnover. 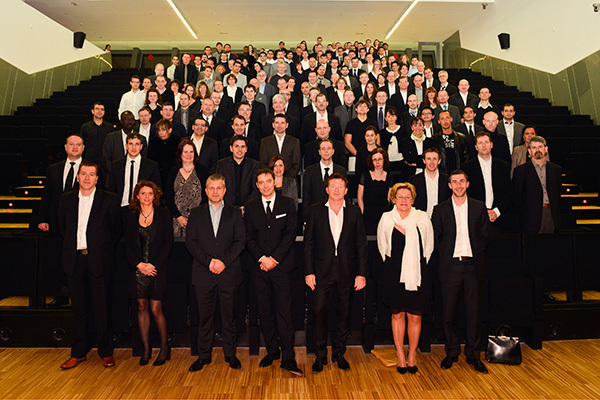 GRAITEC France, in a context of leadership and high maturity, delivered expectations, a solid 2012 with a turnover growth of 13%. GRAITEC France continues to reinforce its strong market leadership in the Structural Analysis solutions market. However, the 3D Structural BIM CAD became more and more strategic and represented 50% of Graitec France Growth. GRAITEC Italy (B&B), exceptional performance of the Italian subsidiary based in Noale and acquired in 2011. In less than a year, GRAITEC Italy B&B has positioned Advance Steel as the standard solution for the steel market, with 245% growth in revenue and almost 150 licenses delivered to exclusively new customers. GRAITEC UK had a great 2012 with an increase of 42% of the Advance Steel turnover, and the creation of a new sales office in the Midlands. The business indicators are showing an over 70% new business ratio and an initial attached rate of 97%. Adris, as a dedicated Autodesk reseller, has over performed the industry standards with 32% growth in turnover and an improvement of its margin rate. Adris not only got certified in several fields, but reached the Autodesk UK Top 3 ranking and is leading the European VAR community in growth. Eastern Europe, in a difficult context for construction, GRAITEC had some fantastic performances particularly in Russia with 64% growth. GRAITEC Czech Republic (AB Studio) has shown a great capacity to sustain its level of activity and business, as leader of the AEC industry in Czech Republic. AB Studio continues to reinforce the presence of GRAITEC solutions in the Eastern Europe region and delivered +39% growth with the Advance BIM suite. GRAITEC Romania delivered a solid performance in 2012 growing the business by 24%. The complete Advance BIM suite is offered to the Romanian market and every solution performed in 2012. GRAITEC Russia continues to gain market share on the market and establish year after year Advance Steel as the standard solution for the Steel construction industry. The growth achievement is impressive (+64%) and the contribution of GRAITEC Russia is more significant year after year. GRAITEC North America, 2012 shows an increasing contribution of the North American operations, the sales and technical organization controls the business and delivers over expectations. GRAITEC North American operations grew by 54% in 2012 with an impressive +108% for Advance Steel. The growth, market share and customer acquisition has been massive in 2012 but it is only the beginning for GRAITEC and we have great prospects for the future. GRAITEC ASIA Pacific is definitely ramping up with 87% growth in 2012. Australia, Singapore, Indonesia and India are leading the GRAITEC growth in this region. GRAITEC reinforces its investment in the region, creating GRAITEC India to drive the Indian operations and offer proximity and local support to our customers. GRAITEC wants to continue its market share acquisition as a global player of the BIM and Design-Build industry. GRAITEC will reinforce its international development, with new offices in USA and probably Brazil and the consolidation of the Asia Pacific operation through GRAITEC offices in India and Singapore supporting our resellers. The GRAITEC strategy remains to acquire customers and market share proposing the full 3D BIM GRAITEC Advance suite. Advance Steel will continue to drive the growth of our 3D BIM Design-Build solutions and consolidate its market leadership in growth and new business. The European Construction forecast is concerning and taking this factor into consideration we will target 15% turnover growth in 2013 and an operational profit up 40%. To support this growth, GRAITEC will recruit approximately 20 new employees who will contribute to the expansion of the company. A new release of the 3D BIM Advance suite is planned during Q3 2013 to better address some key markets and the requests of our customers. 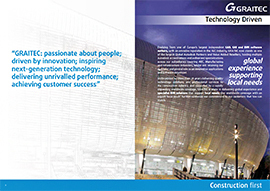 “2012 was a fantastic achievement for GRAITEC. In a very difficult economic environment, GRAITEC has delivered very solid growth month after month. In 2012 we focused on our organic growth and decided to make a pause in our process of acquisition. This makes our performance even more remarkable. Our BIM Structural CAD solutions are clearly driving both the internationalization and the growth of GRAITEC. They benefit from a very unique positioning on the market and give the expected answer to the new challenges of the construction industry, such as Design-Build or BIM processes. In this field GRAITEC is definitely acquiring new market shares faster than any competitor. The GRAITEC solution Advance Steel grew by more than 54% in 2012, this is an amazing success considering the Advance Steel growth rate in 2011 was 40%. This exciting growth in a traditionally slow growing market is positioning Advance Steel as the leading solution in growth, on the market. In 2012 we sold close to 1200 commercial licenses to more than 700 customers, 6 new users join the Advance Steel community every day. It’s important to notice that the vast majority of those users are new users we migrate from 2D solutions to the benefits of 3D, BIM and Design-Build. GRAITEC announces the release of version 2013 of its flagship 3D structural steel detailing software for automating drawing production: Advance Steel. Advance Steel is specifically designed for steel professionals who require an easy-to-use 3D structural steel detailing software for automating drawing production. Advance Steel is based on the implementation of a digital model (BIM / Building Information Model) and automates the creation of drawings, BOMs and NC files. Advance Steel drastically increases productivity and drawing quality, while reducing the risk of errors. The software also allows users to communicate information in the digital model to all project stakeholders. Independent of the AutoCAD platform since Version 2012, Advance Steel improves its ergonomics and ease of use by providing a new user interface element, the “palette”, which contains animated buttons and tooltips. New features, such as direct access to workshop drawings with a simple right-click in the model or the improved capabilities of working with joint groups, further enhance the simplicity of this new version. Advance Steel has many new innovations: first, the ability to create custom connections allowing users to define, store and reuse custom connections in their projects and thus easily adapt to all types of situations. Version 2013 also adds new connections for cold rolled profiles (anti-sag and tie rod systems, trimmer cleats, and eaves beam connections) for faster and more efficient drawing creation. Many other features are also available such as the option to create welding lines in drawings. This function is based on recognition technology of “notable points” that updates automatically when the model is changed which also applies to manual dimensions that are updated automatically by Advance Steel 2013. These innovations provide greater efficiency in terms of modeling and document creation for fabrication and assembly, and significantly increase user efficiency. Advance Steel “Professional” and “Premium” versions come with an Application Programming Interface (API) which allows users with computer programming skills to enhance and customize the software. Version 2013 has been adapted for the Australian, Indian, and Brazilian markets. Besides translation, the following software configurations are implemented: initialization of software settings according to local usage, enriched libraries (profiles, bolts, cladding, etc. ), and drawing style configuration that meets local requirements. Advance Steel 2013 has also been enhanced with specific connections for the Australian market.